Belmont University turned 125 years old this year and in honor of its birthday, the University commissioned local artist James Threalkill to create a mosaic art piece celebrating diversity on campus. As part of the University’s first Diversity Week, members of the Belmont community were encouraged to decorate tiles made of foam board with anything that illustrated their place at Belmont or what they love about the institution. As he collected the completed tiles, Threalkill said a number of themes stuck out. “The pride that is universal with this community and the concern participants have for social equality, fairness, diversity and inclusion were evident in the art they made,” Threalkill said. From there, he said choosing the piece’s overall theme was easy as he arranged the tiles into a larger image and brought the piece to life. 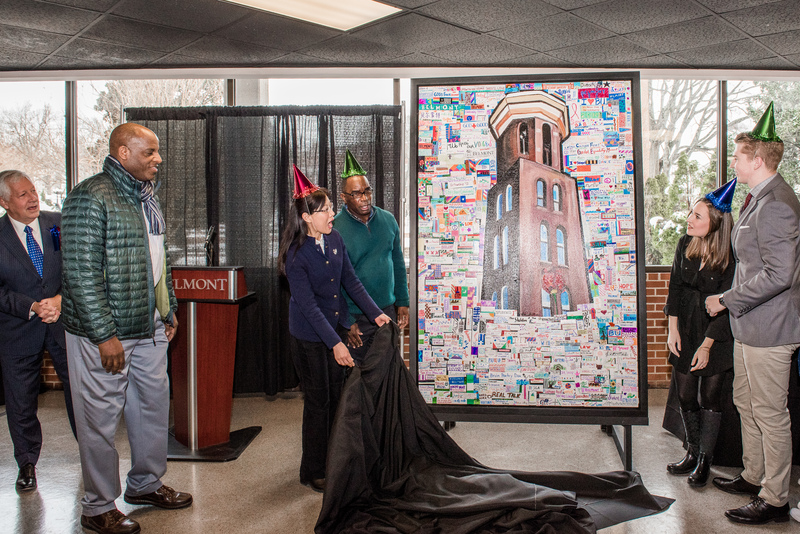 The mosaic was unveiled on Monday, Jan. 25 at the university’s 125th birthday party, one of many events held throughout the year to celebrate Belmont’s anniversary. With Threalkill at the lead, Belmont President Dr. Bob Fisher joined faculty members and student leaders in presenting the piece to the Belmont community, all to the tune of “Happy Birthday” played on the university’s historic carillon bells. The opportunity to celebrate Belmont’s 125th anniversary with a piece that commemorates its diversity and overall spirit was powerful for Threalkill. “I continue to be impressed with Belmont’s efforts to create an inclusive environment for its campus community and the greater community. It was an honor for me as a native of Nashville to be involved with what I consider a very significant contribution to the spirit of collaboration and the appreciation of the creative process,” he said.